This is the first of many photos taken at the May 27 and 28 Tutor/Mentor Leadership and Networking Conference that will be uploaded to our Ning photo gallery in the coming week. We'll also be posting the pdf presentations of many of the speakers and workshop presenters, such as this one, from Charles Cameron, who is a discussion facilitator on the www.socialedge.org forum. The first speaker, Professor James Garbarino, Loyola University Chicago, author of "Lost Boys," on Violence and Young Men, provided a framework and focus for the conference. He said, "it is essential to build a deeper understanding. Good intentions are not enough." 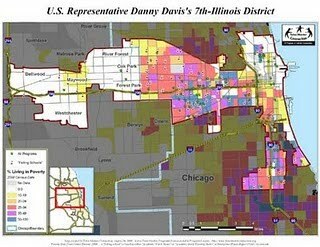 And he said "It matters where you live", showing the connection between high poverty and high violence. Then on Friday morning, Bill Curry, Executive Director, and founder, of Breakthrough Urban Ministries, introduced The Breakthrough Model for Tutoring and Mentoring. 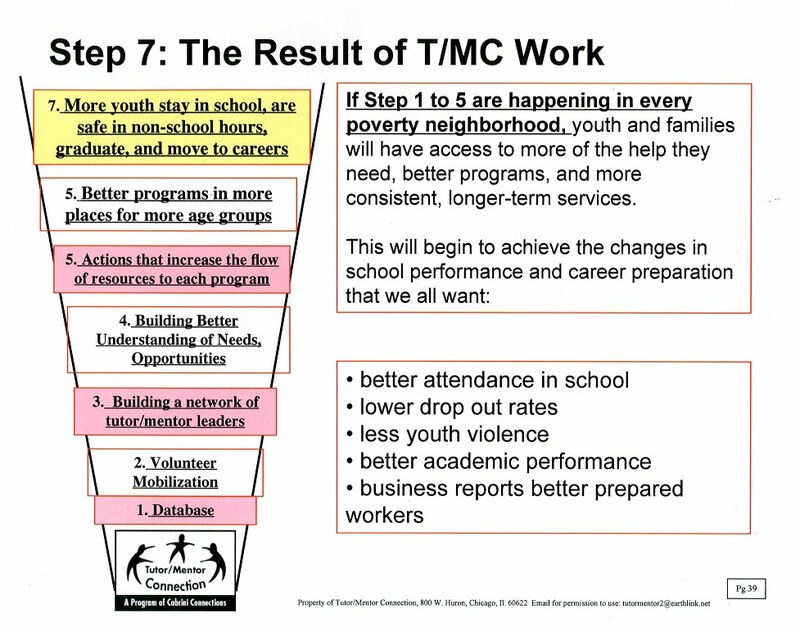 I'll post his presentation when I get it, but this video shows the model, and illustrates a vision that the T/MC fully supports. More than 130 people attended the conference, and presented experience from many different types of tutoring and/or mentoring programs, as well as research on poverty and violence, that we can all learn from. I encourage you to browse the speaker list and visit web sites, and to use the attendee list to make contact and build relationships. 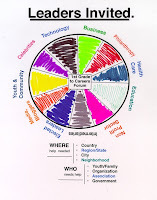 Follow this blog and the Tutor/Mentor Connection newsletter, and connect your ideas and strategies to the T/MC and each other, so we can do more to attract the resources, ideas and talent we need to implement and sustain these strategies for many years. 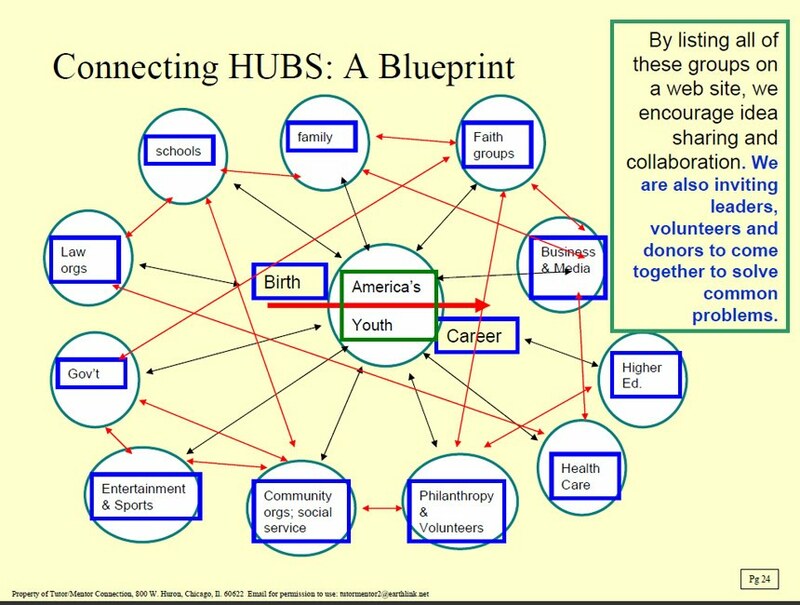 Finally, if you value what the Tutor/Mentor Connection is trying to do, to connect all of these organizations with a constantly expanding library of ideas, we need your donations and sponsorship to keep doing this work. You can sponsor the conference, or sponsor one of our fund raising events. Or you can just send a small donation. I hope you'll help us help all of these organizations help thousands of kids living in poverty neighborhoods of Chicago and other cities. In the introduction the authors write "Our hypothesis is that access to high-quality information will lead donors to allocate funds more strategically to organizations doing the best work. We also believe that having better performance information will help nonprofit organizations operate more effectively and better fulfill their missions." "Aggregate and synthesize programmatic and performance information on nonprofit organizations... Segmentation of nonprofits by issue, geography, size, life stage, and goals will be essential both to enable meaningful performance comparisons and to create a level playing field for large and small as well as older and newer nonprofits. Push this information to places where donors are already seeking information and managing their money." That's what the Tutor/Mentor Connection has been doing on a smaller scale for the past 16 years. We believe that until a city has a master database showing all of the organizations providing the same type service in different places, it won't have the knowledge needed of who is doing the work to be able to go to the next step of understanding what works, and innovating support systems to help existing programs improve and sustain their improvement for many years, while helping new programs form in areas where programs are needed (based on poverty, poorly performing schools, high drop out rates, youth violence, etc.) where our database show that few or no programs now exist. This map was created by the T/MC's map make, Mike Trakan. He'll show it tomorrow at the Tutor/Mentor Leadership and Networking Conference at Loyola. Hopefully many of the tutor/mentor programs on the map will attend, and use the information provided by their network of peers, to learn ways to help their own programs become good, then great, then stay great. Making the map is not enough. We need the ability to quantify the number of programs in each neighborhood, and the number of programs serving youth at each age level, in each neighborhood, We have that ability. You can use the Interactive Tutor/Mentor map to zoom into a community area, or section of the map. You can count the number of programs, just as we can. However, with a few more dollars, and the right talent, we can automate this, so it's easier to make sense of the information the map is showing. Unfortunately, we don't expect anyone from the major consulting firms like McKinsey & Co or from the foundations, or businesses in Chicago who are demanding better outcomes from the public education system to meet the expected workforce shortages of the coming decades. It's not that we don't want them to come. We just don't seem to be on their radar yet. And we don't have the advertising/PR dollars to get their attention. However, if you're reading this, and you have browsed some of the other articles I've written, feel free to forward the invitation. We accept walk in registrations to the conferee, and the real work is what happens in the weeks and months between each conference. Tutor/Mentor Conference. What Others Say. View this video and see how these leaders value the conference. Join them on Thursday and Friday, May 27 and 28, and build your own network. If you can become a sponsor for the Tutor/Mentor Conferences, we'd appreciate your help. I've led a volunteer-based tutor/mentor program for 35 years. I believe the lives of youth and volunteers are enriched in many ways because of participation in these programs. The program I lead now is called Cabrini Connections. It operates in rented space at 800 W. Huron in Chicago and has 75 active teens and 90 volunteers. We have 9 seniors who will graduate from high school this spring and 7 are already accepted into college. 1/3 of our teens have been with us 3 to 6 years. More than 100 of our alumni, going back to the boy I first mentored in 1973, are connected to us on Facebook. When we created Cabrini Connections in the fall of 1992, we had a second goal. 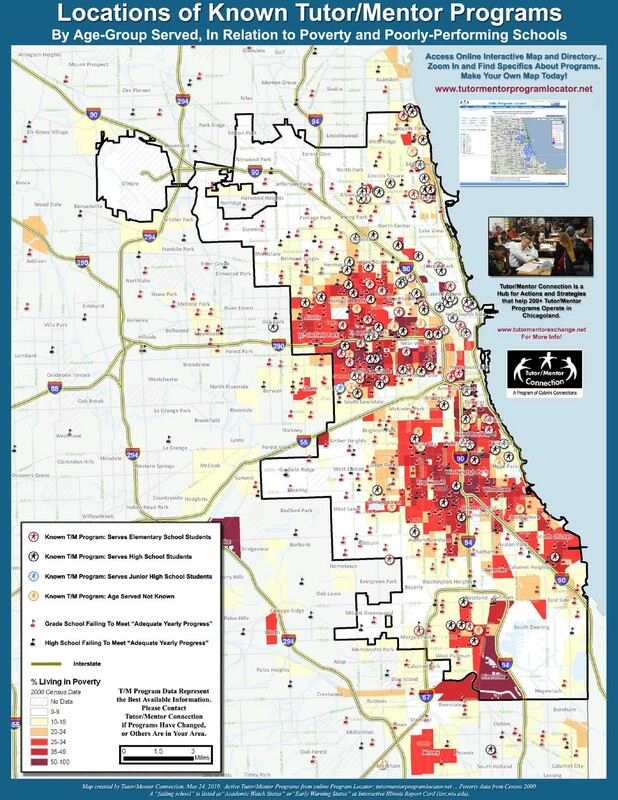 We realized that tutor/mentor programs are needed in all high poverty areas, and that no one had a master database showing what programs were in Chicago, or where they operated. Thus, there could be no consistent leadership intended to help tutor/mentor programs reach more kids in high poverty areas. We called this new effort the Tutor/Mentor Connection. 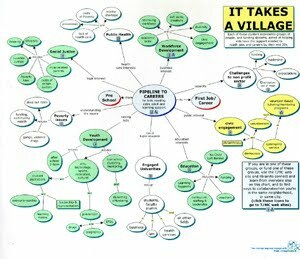 One of the tools we have created to show where programs are needed, and where they are located, are maps, like the one here. 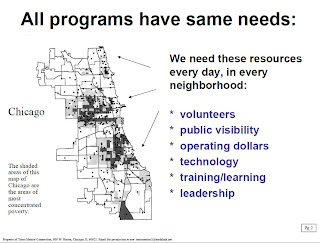 By building a master database of programs, we not only can show where they are located, and where new ones are needed, we can invite programs to work together to generate more of the resources we all need to do this work. That's where this becomes Mission Impossible. While I read in many places how it is important to reduce the isolation of non profit leaders, and provide better information that parents, leaders, donors, etc. can use to know what services are available to young people, I've not been able to find the dollars needed to provide a consistent level of support to Cabrini Connections, or the Tutor/Mentor Connection. The economy, environment, politics, terrorism all seem to work against us. While I have a passion for this work, there are high poverty neighborhoods all over the world where charity dollars are needed to support programs working with youth, the environment, health issues, etc. It seems an impossible task to draw consistent attention, and a consistent, on-going flow of flexible operations dollars to all of these places, on an on-going basis. Yet, to me, this is the only way we can help our teens grow to adults, or others can make a dent in solving complex problems. 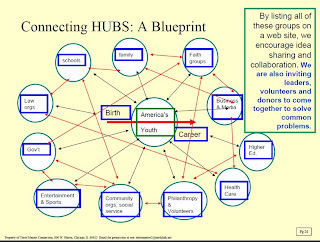 I share a wide range of information on the Cabrini Connections and Tutor/Mentor Institute sites, showing my thinking, and the strategies that I've developed over many years. While I hope benefactors step forward and help us fund this work, I also hope that even if I don't succeed, "others will learn the way" from me and find ways to make these ideas work in the future. If you've read any of the blog articles I've written, you know my goal is to help comprehensive, volunteer-based non-school tutor/mentor programs be operating in high poverty neighborhoods of Chicago and other cities. This graphic illustrates that these programs all need the same resources to survive. If you read about challenges facing non profits, you'll see that money is a huge need. Thus, if you want to do something in response to the tragedy, go to the Chicago Program Links, and browse through the web sites listed there. Pick one or more programs that you feel do a good job, and send them a donation. If you're a business leader, read some of these articles showing the benefits to business of volunteering and philanthropy, and form a team and build a strategy to support tutor/mentor programs in all of the areas where you do business, or where your employees live, or on the routes between work and home. 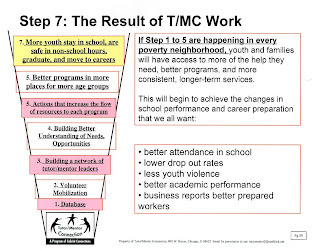 If you're in a neighborhood without any tutor/mentor programs, or with programs that need help to become the "best in the city", use these Steps to Start a Program guides as a blueprint for helping new programs grow. If you're in media, or a network builder, or blogger, pass this message on to others who might be interested and connect with me on Twitter @tutormentorteam . If you use the hash tag #tmcon you can also help draw more people to next week's Tutor/Mentor Conference where the goal is to help people build constantly-improving volunteer-based tutor/mentor programs. 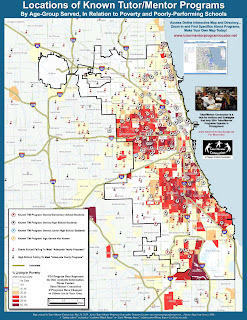 This map illustrates that people from many different backgrounds need to share the responsibility for helping tutor/mentor programs and other youth development activities be in every neighborhood, especially those with high concentrations of poverty and too few non-school supports helping kids move through school and to work. Tragedy in Chatham. Look at the Map. The front page of today's Chicago SunTimes and Chicago Tribune calls our attention to another senseless killing in a Chicago neighborhood. This time, the victim is a Chicago Police officer, who was also an Army Vet just returned from Afghanistan. Read the story then look at the map below. 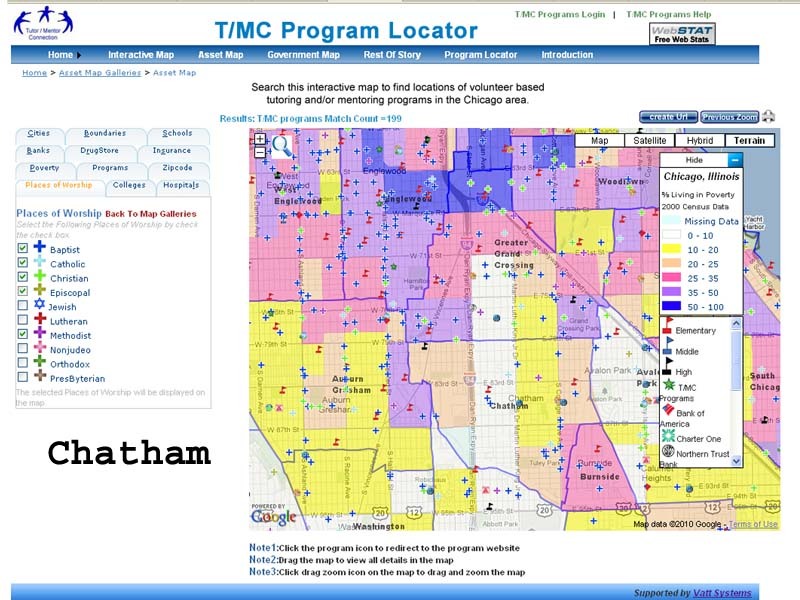 This may was created using the Interactive Tutor/Mentor Program Locator which you can use to zoom into the Chatham neighborhood, and learn if there are any volunteer-based, nonschool tutor/mentor programs. I don't see any. I also see a neighborhood of relative prosperity surrounded by a sea of poverty. How could such a community expect to not be influenced by what was happening all around it? There will be many editorials, speeches, and even marches in the next few days, calling for an end to violence, just as there have been over and over for the past 16 years as we have been building this database and inviting business, faith, meida and political leaders to look at it. I hope that this time the result is the formation of "business planning teams" who look at the information in the Tutor/Mentor Institute and read the articles that I've posted on this blog for the past five years. Begin learning ways to build birth to work mentoring programs around this neighborhood, and in this neighborhood, so young people have better opportunities to make different decisions on how they spend their free time. Next week there will be a Tutor/Mentor Leadership and Networking Conference at Loyola, where the goal is to help people build volunteer-based tutor/mentor programs in high poverty areas. I hope some of those who are reading and writing the editorials will attend. For Better Results, Talk about what people care about. Bill Huddleston read the newsletter I sent yesterday and sent me an email with a link to this video. It's a great piece of advise, for me, and for everyone who is trying to draw volunteers and donors to help them do their work. I'm not quite sure how I'll translate this into my communications because with this blog and my email newsletter I'm reaching out to a wide range of people, sort of a constellation of "everyone" who might want to do something to end the poverty that causes the media stories about violence, poor schools, corrupt government, etc. Each person understands the problem of poverty and poorly performing schools differently, and cares about it differently. Thus instead of a single ad campaign, I need many versions, appealing to many different people. When I was an advertising planning manager with the Montgomery Ward corporation, we sent out one corporate ad each Sunday, and another in the middle of the week. However, these ads have many variations, for big stores, small stores, cold weather stores, warm weather stores, etc. The size, and the merchandise, changed to reflect the interests of shoppers in different parts of the country. If I could do it, my home page would change to reflect the visit pattern of each person who came to the site. We would "learn" from the browsing habits of each person so the next time they visit the site, it would show them a path of learning based on what they care about, to what they can do to help the people we care about. Creating videos like the one I've pointed you to takes a lot of talent. Creating the type of web browsing experience I envision also takes a lot of talent. That costs money. Or it requires volunteers. Or both. If you've read this far, I've said something you care about. Now can you help us. A new Johns Hopkins University survey has revealed widespread innovation among the nation’s nonprofits, as well as efforts by those organizations to measure their programs’ effectiveness. You can download the full report here. Lack of funding. Lack of "growth capital". As I read these reports, I'm constantly looking for ways to INNOVATE strategies that connect the non profits, donors and researchers so we're talking about how we can overcome these challenges and make more and better volunteer-based tutor/mentor programs available to youth living in inner city or rural poverty. Come to the Tutor/Mentor Leadership and Networking Conference on May 27 and 28 and connect your ideas to those of the other people who will attend. Come to the on-line Tutor/Mentor Connection if you cannot come to the conference. To paraphrase an old saying "It's hard to innovate when you're up to your neck in alligators." If we don't make more general operating dollars available to pay rent and hire and retain motivated people, we'll never build the human capital that it takes to innovate new solutions, then sustain those innovations for the many years it takes to have an impact. You can donate to Cabrini Connections, Tutor/Mentor Connection here if you want to help us with this problem. Here's a blog article I wrote in November 2008, just prior to the conference we were holding. It shows how people blessed with high celebrity can be using their visibility to point fans to places where they can volunteer and donate to help kids. This graphic is intended to remind everyone that birth to work starts at the same point for all of us, and takes a minimum of 18 to 24 years for most of us. Our leaders need to find ways to keep pointing their fans at charities who are helping kids to careers for many years, not just once or twice when they are trying to get attention for themselves. Come to the Conference on May 27 and 28 and talk about this strategy with other athletes. Since 1965 when a few employees from the Montgomery Ward Corporation in Chicago began to go to a building in Cabrini Green once a week to tutor 2nd to 6th grade kids, more than 4,500 youth and a similar number of adults have been connected to each other by the tutoring/mentoring programs that were hosted at Wards until the company went out of business in 2000. 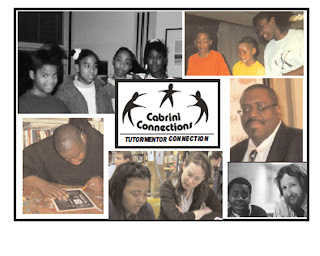 Cabrini Connections was started by seven volunteers from this original program, in the fall of 1992, to help youth finishing sixth grade from the original program have a support system to help them move from 7th grade through high school and into jobs and careers. More than 500 youth have been part of Cabrini Connections since then, with more than 1/3 being active for 3 or more years. The founders has another goal in 1992. They wanted to help every poverty neighborhood have programs like Cabrini Connections. The created the Tutor/Mentor Connection to help make this happen. Now we're connecting to many of these alumni on Facebook and with the help of Leo Hall, Tangela Smith Marlow and Tramaine Montel Ford, we've launched an Alumni Fund, so those who have been given much in the past can begin to give and help Cabrini Connections continue to support them, and youth still in K-12 grades. We hope alumni, parents, former volunteers and friends will go to http://www.razoo.com/story/Cabrini-Connections-Alumni-Fund-2010-Campaign and add their donation. When you do that, post a comment showing what years you were involved, so others can see how the tutoring/mentoring program has connected so many people, for so many years. Each June we host a year-end dinner where we celebrate the work done and point to the future. Money raised from the Alumni Fund and Dinner Donations, will help pay for the dinner, the summer 2010 activities, and the launch of programs in September. If you're an alumni student or volunteer we encourage you to attend the dinner, and support this long-term program with a donation. We've been using maps for many years to point volunteers and donors to tutor/mentor programs in various neighborhoods, and to help people build communities of support for programs all over Chicago, or in specific districts, such as the 7th Congressional District, which is shown on this map. However, we have never found donors who would value this to the point that they would invest in the year to year work it takes to build the database, build the maps, teach people to use them, etc. Even better, this was posted on Twitter and forwarded to many others. 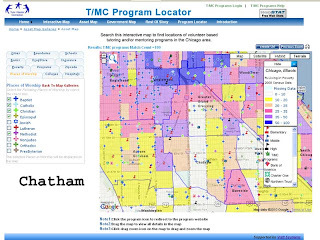 Hopefully it leads one or more benefactors to come forward as sponsors for the T/MC and our map making. If you'd like that role, call 312-492-9614. If you'd like to send a donation, use this form. A few weeks ago, Grammy-winning hip hop artist Rhymefest was in Hawaii working on Kanye West's new album. Last night, he was at Cabrini Connections speaking to youth about his life, the music industry, fear vs. love, and more. See videos and read full story by Bradley Troast. Cabrini Connections is a non-school tutor/mentor program, operating at rented space at 800 W. Huron in Chicago. With the economy making it harder to find donors, programs like this are at risk of shutting down. Yet, learning opportunities like we offer each week, and connections to caring adults who link youth aspirations to jobs and careers beyond poverty, are not available in most public schools. You can help us keep this program going by becoming a donor/sponsor of our year end dinner, or annual golf benefit, or just by using this form to send a contribution. Or you can add us to your estate plan, and assure our future with a bequest. You can help programs like this be available in all parts of Chicago, and in other cities, by participating in the Tutor/Mentor Leadership and Networking Conference on May 27 and 28 at Loyola. 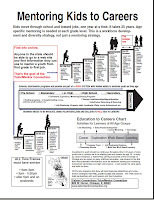 What will it take to help youth from birth to work? This is a graphic that I posted in an article I wrote three years ago. The questions and ideas are as relevant now as they were then. The only thing that has changed is that on Linked In and Facebook we're now connected to more than 100 of our former students and volunteers. The final goal of our success steps, has been that our youth and volunteers are connected as adults, and helping each other, while also helping Cabrini Connections and similar programs be working with kids still coming up the pipeline. Through the Tutor/Mentor Leadership and Networking Conferences, and our Ning Group, we're connecting Cabrini Connections with leaders and supporters of hundreds of other programs in Chicago and other cities. Some of our former volunteers have become very successful in business. For instance, Mary Dillon, who was a volunteer almost 25 years ago when she was working with the Quaker Oats Company, was just appointed to be the new president of US Cellular. 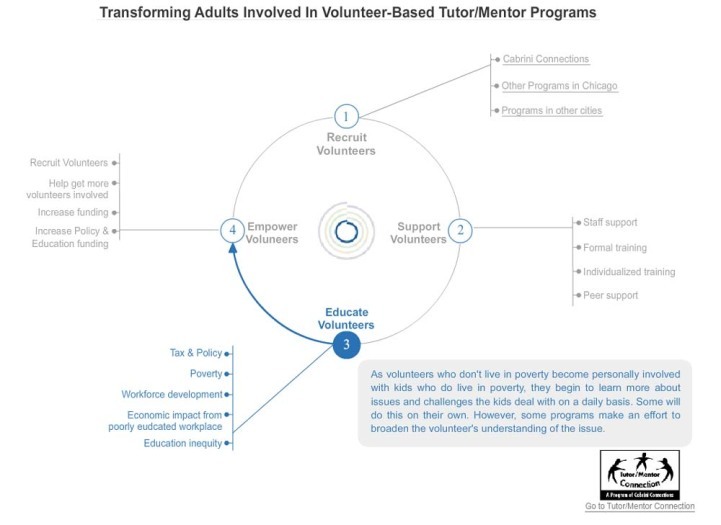 How do we re-connect with volunteers who may have been part of the tutoring program at Montgomery Ward in the 1970s and 1980s, and who now may be in positions to influence volunteering, public policy and philanthropy? 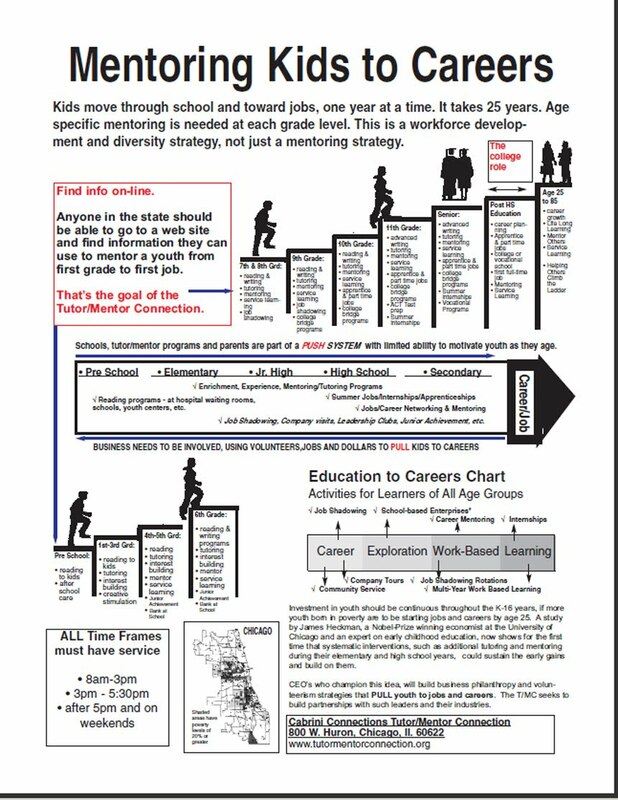 If leaders of every volunteer-based tutor/mentor program in the country can find ways to do this, and focus those leaders on strategies that help all tutor/mentor programs grow, not just their own, we have an army of leaders who can help support this birth to work mentoring strategy. This image of the constellation reminds me of how many people are in the world, and how difficult it is to attract just a few of them to read the ideas shared on this blog, and the links we point to. I think of this every day, and I am almost ready to give up. The information keeps expanding, but the time people have to read and reflect has not changed. The day still only has 24 hours, and most of them, for most people are focused on personal issues, family issues, work, recreation, politics, health....not on helping inner city kids living in high poverty neighborhoods. Yet the same image that frustrates me, gives me hope. I don't need every star in the universe to read and respond to this information. I only need a few people with the right mix of talent, network, financial resource, technology, knowledge, and commitment to connect with me and take co-ownership of the ideas we share. When Margaret Mead wrote about "few people changing the world" the internet was not on her radar. I wonder how she would phrase that possibility today. In such a big universe, I am optimistic that these people exist. We just have not connected yet. Future of Education. Uses of Technology. 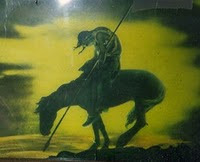 I follow articles written by George Siemmens because they point me to many ideas that I've tried to apply in my own work. This article, titled Changing the System at a National Level, stimulate thinking about uses of technology in education. I encourage you to read and reflect. Helping Low Income Youth Through College - What does it take? I attended a college access meeting yesterday and the Executive Director of the Illinois Student Assistance Commission was asked what it really takes to assure that more low income and minority youth are finishing college. He said "A well informed adult that cares about them." 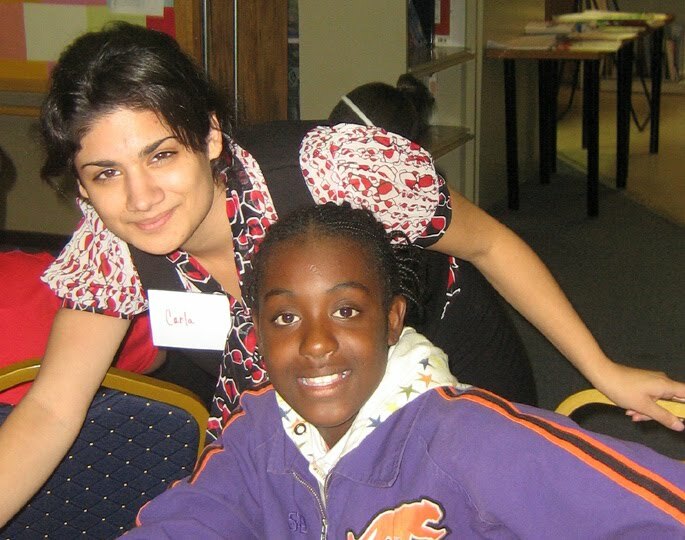 The goal of volunteer-based programs like Cabrini Connections is to connect youth with adults, and support growing relationships in which strong caring bonds form. While we have operated our tutor/mentor program for 16 years, the lack of predictable, consistent funding makes it difficult to keep well-trained leaders, and makes the job of "creating a well-informed volunteer based" extremely difficult. Yet, we have nine seniors graduating from high school in June and seven are already accepted to college. We've had more than 500 students participate in Cabrini Connections for one to 7 consecutive years since 1993, and now on Facebook we're connecting with many of them, which extends our relationships even beyond seven years. More than 700 volunteers have been part of Cabrini Connections since 1993. Many of our leaders and donors have been connected to us for 15 or more years. Many of the students who joined us before 2000, or with the Montgomery Ward/Cabrini Green Tutoring program, which started in 1965, are now adults who are raising their own children. However, Chicago has close to 200,000 school aged youth living in high poverty neighborhoods, so we need leaders who are thinking in larger terms than one program. We need leaders thinking of ways to have programs like Cabrini Connections operating in every poverty neighborhood. We've created a program locator and database of more than 160 Chicago tutor/mentor programs, which we hope leaders, volunteers and donors will use as a starting place. In order to have a full range of tutor/mentor programs in every neighborhood, we first need to help these existing programs get consistent funding, and other needed resources. 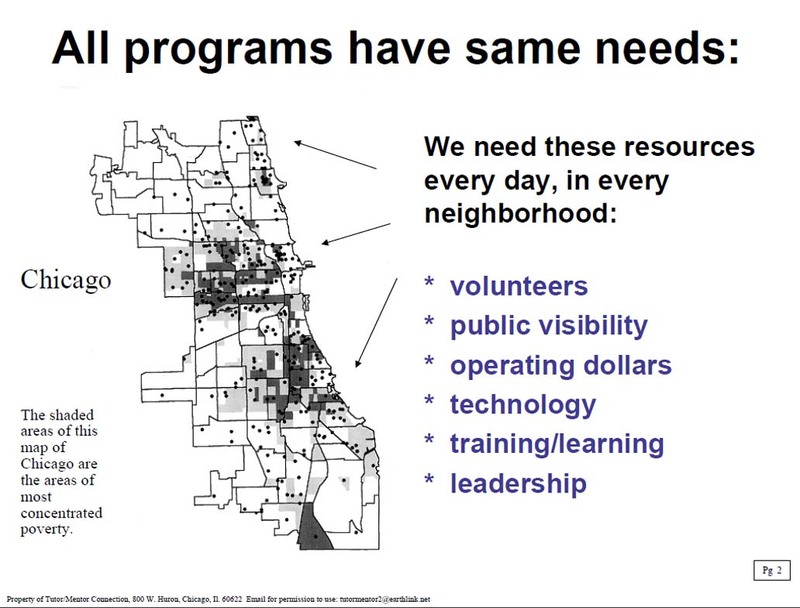 Then, we need to help new programs form in areas where none exist. No program needs to start from a narrow base of ideas. Every program needs to start, and grow, by constantly learning, and borrowing, from the ideas of existing programs. That's the goal of the Tutor/Mentor Connection. The conference we host every six months is an opportunity for many of these learners to connect face to face. Instead of thinking you can learn this all in one day, we want to encourage people to form study groups, in high school, college, business and faith groups, so people learn this over a period of years. Below is a list of sections of this library. Volunteer-based tutor/mentor programs are part of the community supports that would be needed in this type of strategy. I joined a Facebook Group today titled "Stop Killing our Children". I'm one of 39,000 people in this group. 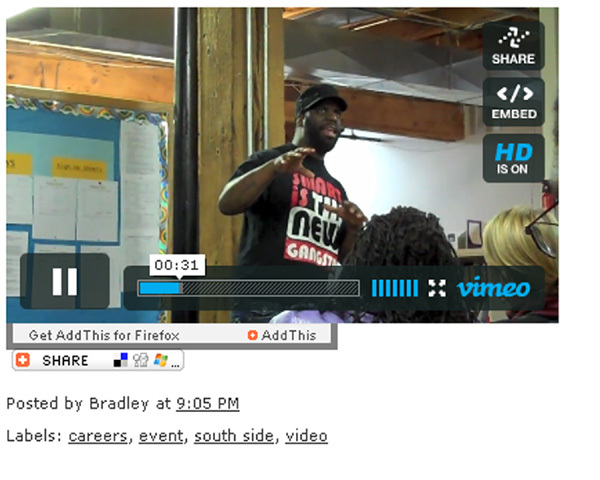 Imagine if every one were to contribute $10 to a tutor/mentor program in Chicago. That would be $390,000 new dollars to fund programs like Cabrini Connections. Imagine if everyone were to recruit 30 of their Facebook Friends to do the same. That would make the total almost $1 million. 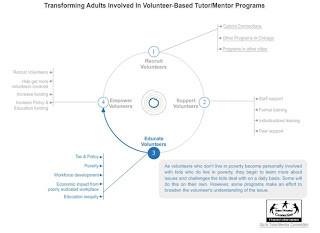 Can you imagine what that would do for making volunteer-based tutor/mentor programs like Cabrini Connections available to more kids, in more neighborhoods? I posted the graphic above, which is an animation that shows how volunteers become more deeply committed to the kids, and the programs, each year that they are involved. If these 39,000 interested people give $10 a year, and encourage the same from 30 of their friends, who recruit 30 of their friends, programs in many places will have the flexible operating dollars needed to coach this type of involvement. READ THE CABRINI FUND RAISING BLOG AND PICK AN EVENT TO SUPPORT. Attend the Tutor/Mentor Conference on May 27 and 28 and learn more about how you and your friends can help make more and better learning and enrichment and career mentoring activities available in high poverty neighborhoods.